We work with leading manufacturers of Reagents, Biochemicals, Kits, lab consumables and Instruments across the globe offering a wide range of cutting-edge technologies in there domain. All principal partners along with us are fully committed to offer you the best experience in terms of product quality and support that we extend to all our customers in the Indian region. We encourage you to browse through our supplier’s pages classified under specific Areas of Interests. 3D Biotek, LLC is a high-tech biomedical engineering company located in New Jersey, USA. Using its Precision 3D Micro-Fabrication Technology and Advanced Bio-Manufacturing Technology, 3D Biotek is a leader and the industry's only dedicated driving force in the research and development of novel 3-dimensional (3D) cell culture devices for stem cell/tissue engineering, drug discovery and broad cell biology applications. 3D Biotek provides the finest quality 3D cell culture products and produces customized products to fit our clients’ special needs. Antibodies are outstanding tools for biomedical research and essential components of a myriad of diagnostic tests. They are also the largest and fastest growing source of new drugs. The vast majority of therapeutic antibodies are made using recombinant DNA technology, which has enabled the engineering of specific functions and the reduction or elimination of undesirable side-effects. However, protein engineering has largely been ignored during the development of antibodies for diagnostics and research, where most are still made by immunising goats or rabbits (“polyclonal” antibodies) or using hybridoma cells (“monoclonal” antibodies). AdooQ BioScience is a supplier of biochemicals located in irvine, CA since 2006. In past five years, we have been a renowned name engaged in manufacturing and supplying small molecule inhibitors including kinase inhibitors on kinds of signal pathway, such as PI3K, AKT, HDAC, MARP etc. Advanced BioMatrix is a leader in the life science of three dimensional (3D) applications for tissue culture, cell assay, and cell proliferation. Our products are recognized as the standard for purity, functionality, and consistency. We have extensive expertise in production, isolation, purification, lyophilization, cell culture and testing of proteins, adhesion peptides, attachment factors, substrate rigidity, and other 3D matrix products. With a strong background in hemostasis research and a focus on reagent development, Affinity has become a primary manufacturer of more than 250 reagents and kits used in hemostasis and thrombosis research and diagnostics. Our product line includes: coagulation related antibodies, matched-pair antibody sets for ELISA, depleted/deficient plasmas, protease inhibitor deficient plasmas, the VisuLize™ line of complete ELISA kits and the VisuCon™ & VisuCal™ coagulation controls and calibration plasmas. .
Agarose Bead Technologies (ABT) is dedicated to the research and development of biotechnology products derived from agarose. The company offers a wide range of activated agarose beads for affinity chromatography and enzyme and antibody immobilization processes, as well as a variety of non activated agarose beads for size exclusion chromatography. The products also includes a variety of superior quality agarose powders for electrophoresis applications. Agrenvec is a European biotech specialized in plant production of mammalian recombinant proteins and antibodies for the R&D market. Was created as a start-up company in 2002 with the in-licensing of several patents from the INIA (Instituto Nacional de Investigación y Tecnología Agraria y Alimentaria). 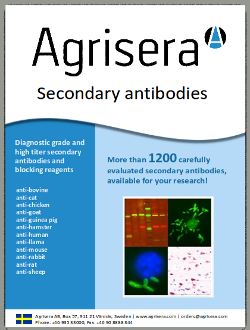 Agrisera is a Swedish company specializing in polyclonal and monoclonal antibody production, offering 1000 primary antibodies for plant and algal cell biology research and over 2000 secondary antibodies for various applications and in various quantities, all available online. 30 years in the antibody business have taught us a lot and we are proud to say there are few problems we cannot help you to solve. Agrisera is still a small company, easy to contact and as a client you get direct access to Agrisera staff scientists who will answer all your queries promptly. "Fast, collaborative and efficient" - as customers say about Agrisera. AimPlex Biosciences, Inc. leverages years of assay development expertise to offer comprehensive solutions in biomedical testing. Founded in August 2011, the company is committed to developing and providing high-quality, cost-effective assay reagents for flow cytometry analyses. Our immunoassay products employ existing flow cytometry analytical platforms for detection. Antagen Pharmaceuticals, Inc., formerly known as Antagen Biosciences, Inc., is a biopharmaceutical company dedicated to combating autoimmune diseases, infectious and cancerous diseases through its novel approaches of discovery, development, manufacturing and commercialization of biologics. Its multi-platform laboratory science capabilities, and top-notch systems and procedures also give the company a much-needed edge in the contract-manufacturing-service market. We are the online marketplace for proteomic products. We offer more than 1 million research antibodies, ELISA kits, proteins and related products from over 150 suppliers. This is a unique portfolio on the web. Apacor develops and markets practical, cost-effective solutions in the field of medical diagnostics. The focus is on Microbiology and Clinical Chemistry applications and testing procedures. Apacor is a manufacturer of innovative products sold to laboratories throughout the world. We are an international biotechnology company operating within the Institute of Aquaculture at the University of Stirling. We develop and market monoclonal antibodies antibody conjugates, and Rapid Kits to improve fish health management. We have been working in the field of fish immunity and fish health management at the Institute of Aquaculture since 2001. Art Robbins was founded in the year 2003 in Sunnyvale, CA, USA. ARI designs and manufacture life science products with focus on Protein Crystallization.